I strive to have a classroom that is a safe and happy place to learn. I want my students to know how much I care about them and that our classroom is a safe place where they can share their ideas and ask questions if they are unsure of something. I also want learning to always be fun. We learn best when we are having fun! Below is some information about how we work together to ensure that our classroom is a fabulous place to learn. Please note that all of the ideas below are not used each year. It always depends on what we are working on as a class. 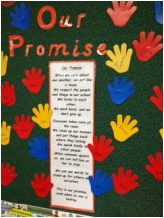 In order to provide a safe and happy learning environment, our class works together to create "Our Promise" each year. Together, we brainstorm ways in which we can learn together and demonstrate respectful, responsible, and safe Aiken behavior. Students agree to the promise by signing their name. The poster is hung throughout the school year. Each student colors their own "Behavior Stick". It is a popsicle stick in the shape of a person. Each stick is placed into our blue pot to start the day. At the end of the day the students color in their behavior chart in their "Take Home Folder". It is just a monthly calendar. Please be sure to check this chart daily. Orange - AMAZING! This is a demonstration of a student who went above and beyond classroom expectations!!! Blue - Nice Job. This is a demonstration of a student who showed good Aiken behavior throughout the school day. Green - Oops! This is a demonstration of a student who needed reminders about their Aiken Citizenship. Yellow - Ut-oh! This is a demonstration of a student who needed a few reminders about their Aiken Citizenship. Red - Stop! This is a demonstration of a student who needs to have a conversation with their teacher, parents, or the principal. Teamwork is so important. Our Golden Feathers from Swoop (our mascot) encourages teamwork throughout the day. As a class, we work to show our best Aiken Citizenship. We will fill our wall with our Golden Feathers. Each time we reach 25 Golden Feathers we celebrate our teamwork! Sometimes students forget our expectations in the hallways. If this occurs, I secretly choose a "Mystery Walker". I watch that person carefully as we transition in the hallway. If that person shows great Aiken Citizenship throughout our transitions they are celebrated in our Afternoon Meeting! 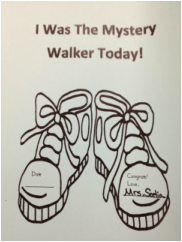 It is quite an honor to be the Mystery Walker!